Life in the sub-millimetre is certainly tougher than in the millimetre bands that Mopra works in. The sky can be nearly opaque, the conditions you’re working in are tough (try running when at 5,000m! ), and making the instruments work is so, so much harder. But you get a new perspective on the cosmos, a window that peers directly into the clouds of dust and dense gas that line our Milky Way. And that makes it all worthwhile. Mopra’s baby brother, Nanten2, a 4m telescope on the Pampa la Bola on the 5,000m Atacama plateau in Chile, is such a sub-millimetre telescope. On it is an incredibly clever instrument called SMART – built by our colleagues from the University of Cologne. But using it is difficult, very very difficult. It can be a trial. We have just brought in the first data for the season after quite an ordeal. It is measurements of excited lines of carbon monoxide from the Carina star-forming complex. Graeme Wong at UWS is studying them for his PhD. But the data doesn’t look too nice compared to Mopra, and it will take a lot of work to clean it up and make it presentable. 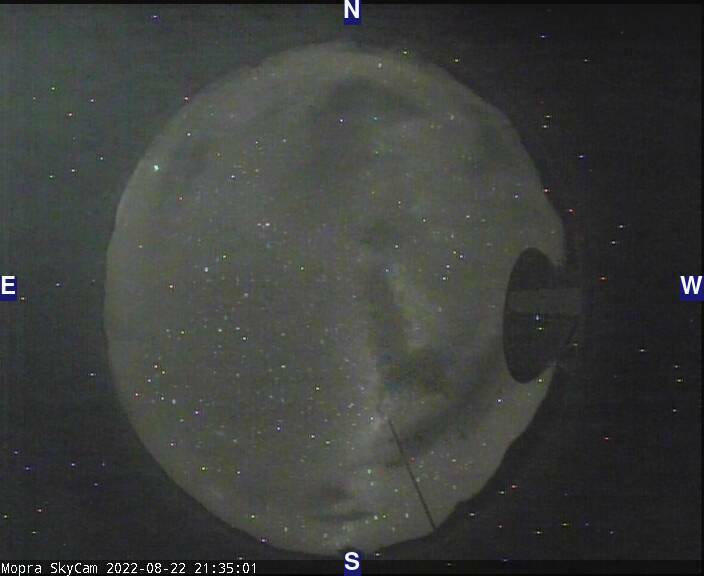 Here we show some raw data, straight from the telescope. Each box represents a single pixel on the sky – SMART has 8 of them, and the fuzzy lines are spectra – very many of them. They don’t look too nice, at first glance, do they?! But there is much that can be done to clean them up – there are many artefacts in the data set that can be removed in post-processing. That’s what PhD students are good at! But we know we have a detection. In the second column you can see a little bump at about -10 on the x-axis (that is in fact -10 km/s). That’s the line for Carbon Monoxide coming from the 4th rotational level, and emitted at a frequency of 461 GHz! That’s what we’re after. When Graeme has finished his work on this data set he’ll have a nice map of the distribution of this molecule, showing where warm and dense molecular gas is in the Carina complex! And then we can try and make sense of what it all means…..